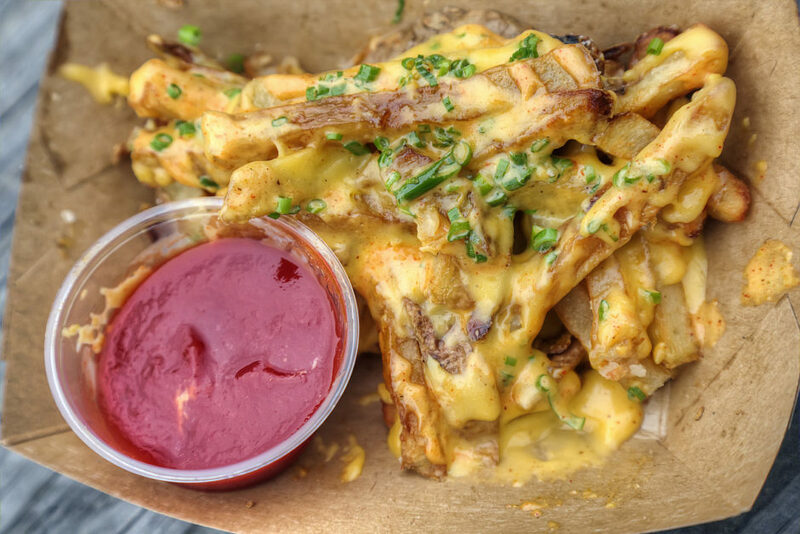 There’s a new food truck on the Hudson Valley scene, and it’s truly special. 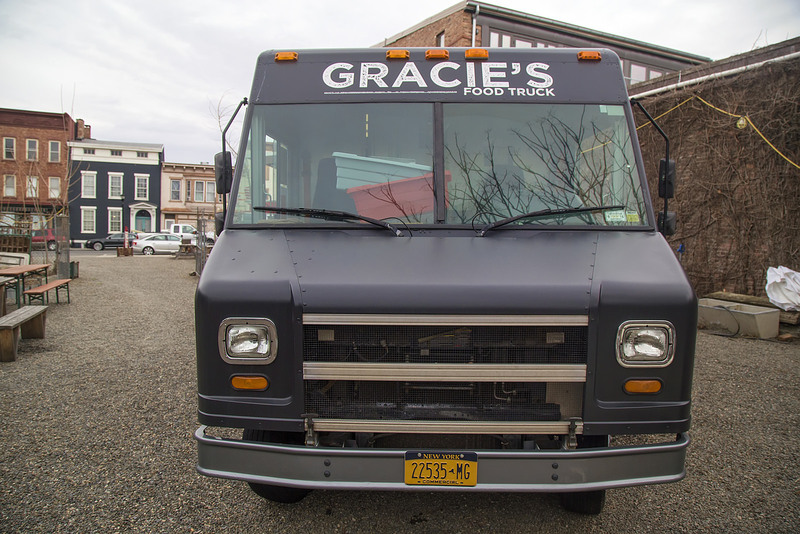 Gracie’s opened their window in November 2014 serving American classics like burgers, fries, and doughnuts, and their popularity has grown ever since. 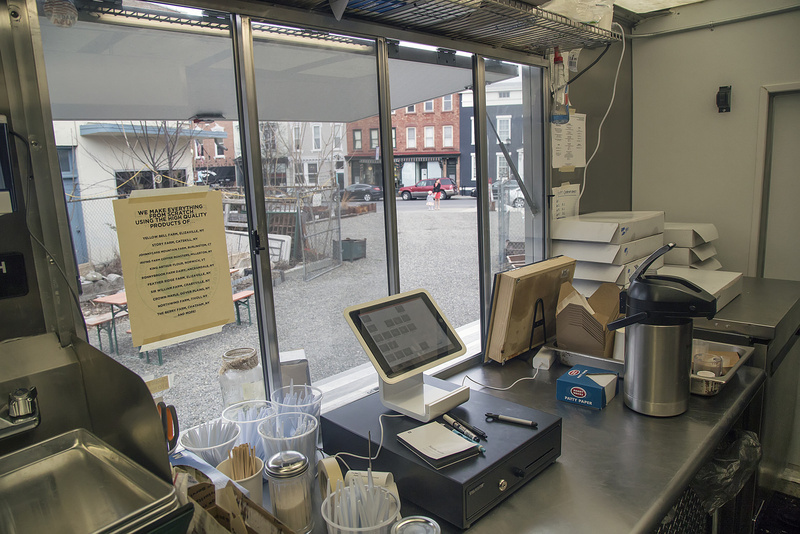 Owners and chefs Allyson and Andrew are genuinely passionate about food: they drive to area farms to pick up their ingredients, prepare everything from the condiments to the sodas from scratch, and the result is a one-of-a-kind fast-food experience. I talked with Allyson and Andrew about how much I loved their food, and we decided to collaborate so I could spread the word. I hope you enjoy this Q&A and my husband Andy’s photography. It was a pleasure interviewing them! Hi guys! Tell us a little about your cooking and baking background. Allyson: I grew up loving food. Andrew and I met in school at the Culinary Institute of America, in Hyde Park, where we graduated with Bachelor’s Degrees in Culinary Arts, Baking & Pastry Arts, and Management. Since then, we have focused on the ultimate goal of starting our own business. We were on the opening team at a couple different start-up restaurants, which gave us a great insight and experience into the process of opening a restaurant. Andrew spent years working in butcher shops where he learned how to butcher whole animals, as well as the process of curing, aging, smoking, and fermenting meats. 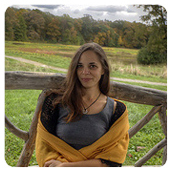 I did an apprenticeship at a diversified farm learning a bit of everything from raising animals, growing organic vegetables and medicinal herbs, wildcrafting, beekeeping, and even cultivating mushrooms. This total combined experience has rounded out our knowledge of, and respect for, food. Andrew: I got my first kitchen job when I was 14. I’m 26 now, and have spent about half my life in a kitchen. While I didn’t know when I was 14 that I would spend the rest of my life working in the restaurant industry, I certainly never saw myself in an office building. I love the adventure and creative aspect of the kitchen. Allyson: About two summers ago, we began a small baking and confectionary business, selling at farmers’ markets in South Salem, NY and Ridgefield, CT alongside my parents, who were selling beef from our family farm, Johnnycake Mountain Farm in Burlington, CT. Eventually, in an effort to bring a little more life to the markets and for lack of prepared food vendors, we began cooking and serving burgers using Johnnycake’s ground beef. We made the buns, cooked thin-patty burgers in cast iron on a Weber grill, and topped with bartered market veggies. They became quite popular, and so the concept of Gracie’s began. What we are serving now is a much more refined product, but those were its beginnings. At some point, a line of seasonally flavored donuts replaced the random specialty pastries and confections… and it was perfect. Andrew: You could really say that our business started soon after we met, about five years ago. We have been brainstorming ideas together constantly. In all of our experiences, we’ve always been more motivated by learning more about our trade than making a decent paycheck. This is what has driven us so far, and the experiences that we’ve had are priceless. Where are you from and why do you choose to live in the Hudson Valley? Allyson: I grew up in South Salem, NY, and Andrew is from New Jersey. After both attending school in Hyde Park for several years, we just grew to love the area and found that we didn’t want to leave. Andrew: We moved around a bit in the last several years, from Hyde Park, to Poughkeepsie, to Staatsburg. We tried to move to Vermont, for an off-the-grid experience in a solar-powered straw-bale home in the woods, but after a few months I was totally homesick. We ultimately came back after a year, and about three years ago we found ourselves a new home in Catskill. We love it here. Andrew: We get asked this all the time, yes it is. We’re more than just the faces on the truck Friday through Sunday! We’re also delivery drivers, dish washers, prep cooks, plumbers, refrigeration experts, secretaries, and so much more. This is actually more like 4 full-time jobs done by two crazy people. Allyson: We are pretty much all Gracie’s, all the time. It can be hard to shut off. Currently, we spend the first half of the week prepping and running errands all over the Hudson Valley, allowing us to be open and serve on the weekends only. Where does the names Gracie’s come from? Allyson: I wish there was more of a story to it. We came to the name Gracie’s because we liked the old-school feel of the name, and my middle name is Grace. We thought it fit our concept pretty well and the truck looked like a Gracie for sure. Andrew: We feel strongly about using local products. It’s just better on so many levels. We find that not using any convenience products and buying as many ingredients locally as we possibly can is the best way for us to create tasty food while supporting small businesses in our area. Allyson: We are a little obsessive, and definitely perfectionists. We make everything entirely from scratch so that we have complete control over the quality of the food that we serve. We have time because we make time. It can be stressful. I’m not going to say there haven’t been some pretty rough late nights, but at the end of the day, it’s worth it. 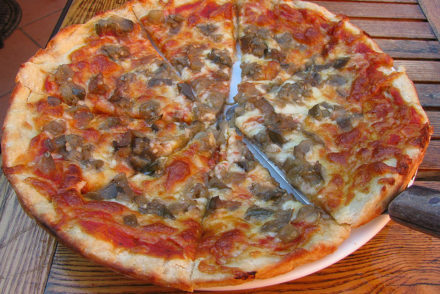 We feel really good about the food we are serving, and it is extremely gratifying when our customers appreciate it too. Andrew: We found the Hudson Valley to be the perfect place for us to do exactly what we wanted to do, which is simply to sell the best quality food we possibly can. To do that, you have to begin with the best quality ingredients, and that is where the HV plays a huge role for us. It also helps that the kind folks we’re serving really can taste the difference and appreciate good food. There are more farms and small producers here than we could ever dream of, and they all have something amazing to offer – we only wish we could support them all! Where do you do all the cooking and baking? Allyson: Because our methods of preparation need a lot more space than we have on the truck, we had to find a commissary: a large commercial kitchen (often shared) where you have access to cooking facilities, storage, etc. They’re pretty common in big cities, but around here it wasn’t exactly an easy task. If you do some research and get creative it’s not impossible to find something that will work for you. We are currently renting a kitchen at the former Koch’s Restaurant in Leeds. We do all of our baking and prep work there, and deliver the product to the truck in the morning before opening. How do you choose doughnut flavors? Which is your favorite? Allyson: Our donut flavors are very much based on seasonal availability. We are constantly jotting down ideas for flavors and recipe testing. 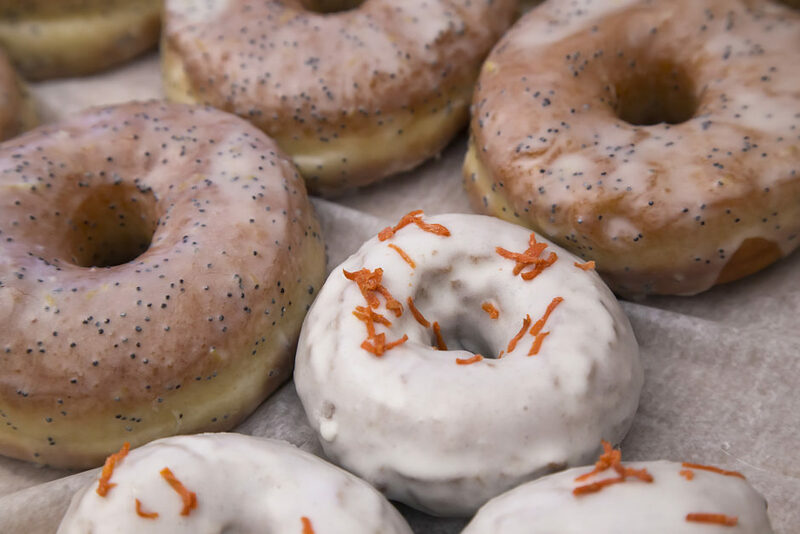 Most of our best ideas, donut flavors and in general, happen on long drives. My current favorite is the Salted Caramel & Coconut, which might soon become a standard flavor because I think I just have to! 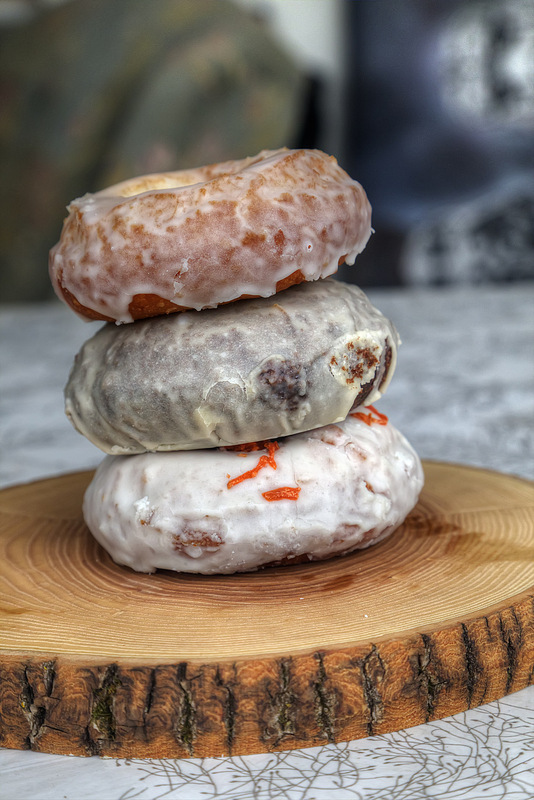 We’ve heard some pretty ridiculous adjectives used to describe this donut (i.e., “crack,” “the bomb,” “transcendent,” and I’ve recently heard they can even cure hangovers). How was the doughnut burger born? Andrew: We’ve seen other people serving donut burgers, but we were never that interested in trying it. Not exactly something we would have ever considered putting on our menu. But we sell burgers and donuts, it just made sense. So we tried it, and it kind of blew our minds. Allyson: I was skeptical. But it’s… really good. Had to share it. 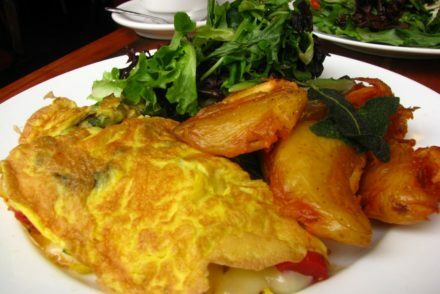 What is your favorite savory thing on your menu? Andrew: The Gracie’s burger is definitely my go-to. This burger took a long time to get to where it is, and to me, it’s the perfect burger. But the fried chicken sandwich is a must. Those are almost always my recommendations. Allyson: For those who come for the food: the Gracie’s Burger, or Fried Chicken Sandwich. For those who come for the donuts: the Vanilla Bean glazed (a favorite of mine! ), or Buttermilk Old-Fashioned. 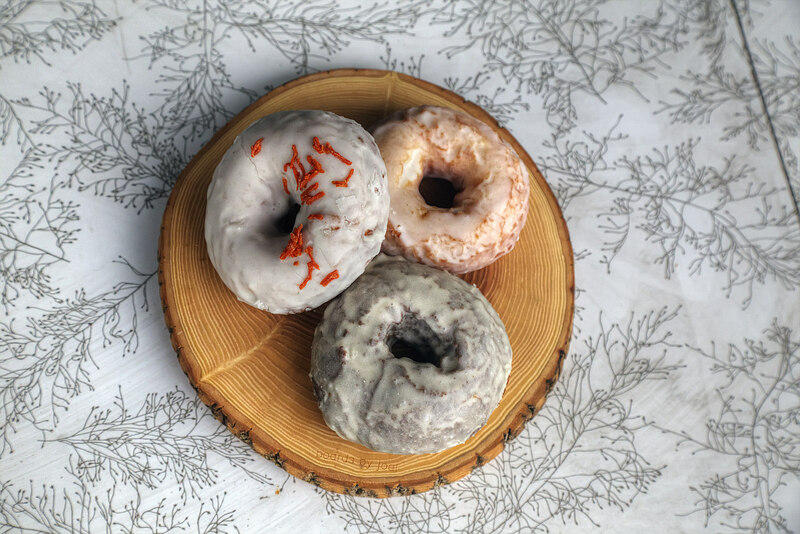 Do you have a favorite doughnut shop, local or otherwise? 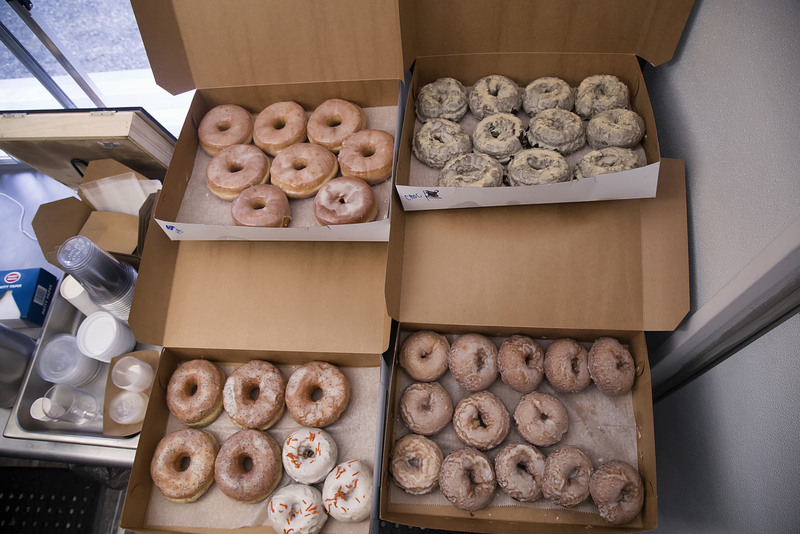 Allyson: We have some very fond memories of our first Doughnut Plant experience. And the Apple Pie Bakery in Hyde Park makes an amazing brioche donut. I follow tons of awesome donut shops on social media for inspiration, but I haven’t tasted most of them! Can you tell us one of the most difficult things about running a food truck? One of the most surprising? Andrew: One of the most difficult things is definitely the schlepping! Not only do we have to pack up all our food, equipment, tools etc. each day, but if we are traveling that also means hauling around our 400 lb. generator for power. Also quite difficult is actually just finding a legal parking space. It may seem simple, but it’s really not. Private property is usually the way to go but it’ll cost you, and that’s on top of paying the town, county and state for permits. 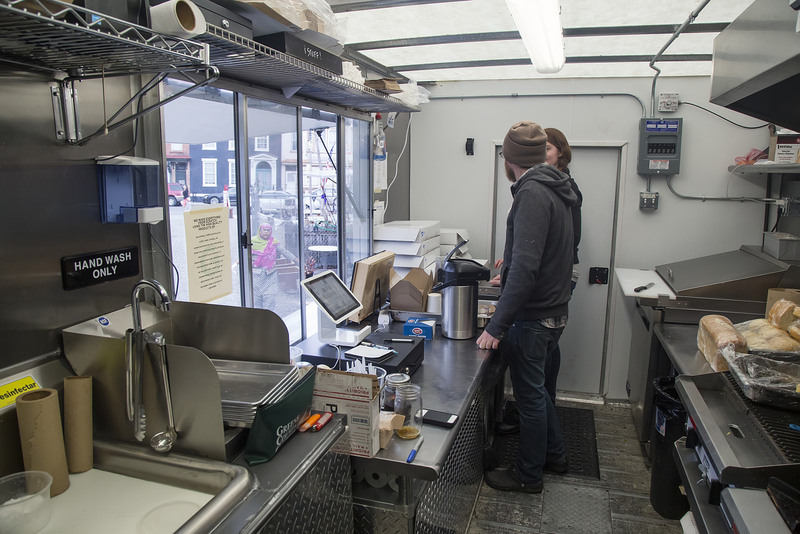 Many towns aren’t exactly food-truck friendly yet but we are hoping that changes soon! Allyson: One of the most surprising things about what we do would definitely be the amount of prep work that it takes to get open for the weekend! Even though we are only open a few days a week, we work seven days, up to 19 hours a day. The legwork is incredibly time-consuming. Many farms and purveyors can’t deliver to us for one reason or another, which means we are driving all over the HV on our “off days” to this farm and that farm with a gigantic cooler in the back of our Jeep. Our philosophy is kind of a double-edged sword, as we also have to spend so much time doing all our baking, making more ketchup, mustard, cheese, grinding beef, curing & smoking bacon, etc. Countless people have asked us why we aren’t open more often, or get upset when we have to change our schedule at the last minute. It’s important for us to let our customers know that we are doing what we can. That said, we hope to expand soon; we’re looking for some help! What had made it worth it so far? Allyson: After working a 19-hour day, the only thing that makes it worth getting up and going to work the next morning is our amazing and loyal customers. We’d be nowhere if it weren’t for all of them, and the support and encouragement that they give us – there’s nothing more gratifying. Andrew: I’ve always been inspired by the old-school burger joints and lunch counters that just sling delicious burgers all day. I wanted to create the classic diner burger using only the best ingredients. We wanted our burgers to have a reminiscent effect on our guests. In that sense, I believe I’m inspired by the challenge to take something so classic, that many people may overlook in terms of quality, and to do it the very best that I can. 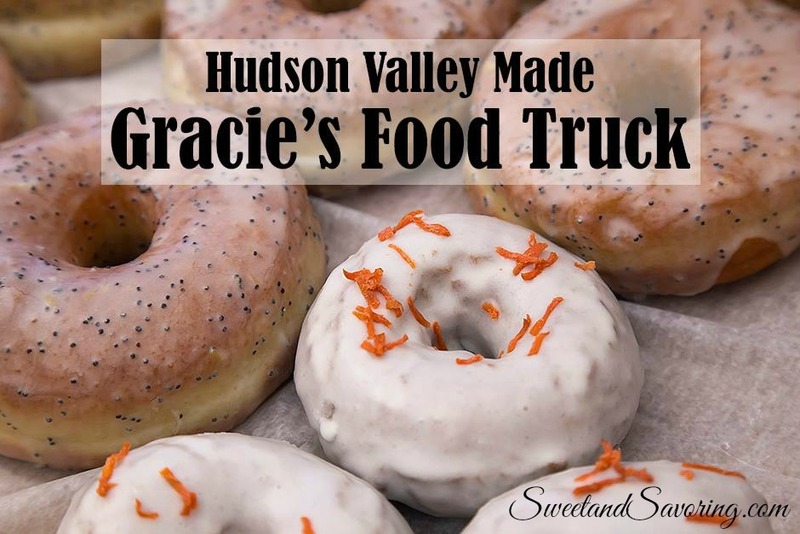 What other Hudson Valley food trucks do you love? What are you favorite restaurants in the area? Allyson: We love Pippy’s Hot Dog Truck in Palenville, and the Catskill Mill Food Truck in Catskill serves great Vietnamese food. There are so many food trucks in the HV these days, and we really love and respect all of them! Andrew: Our favorite place to go after a long day, or any day really, is Crossroads Brewery in Athens. 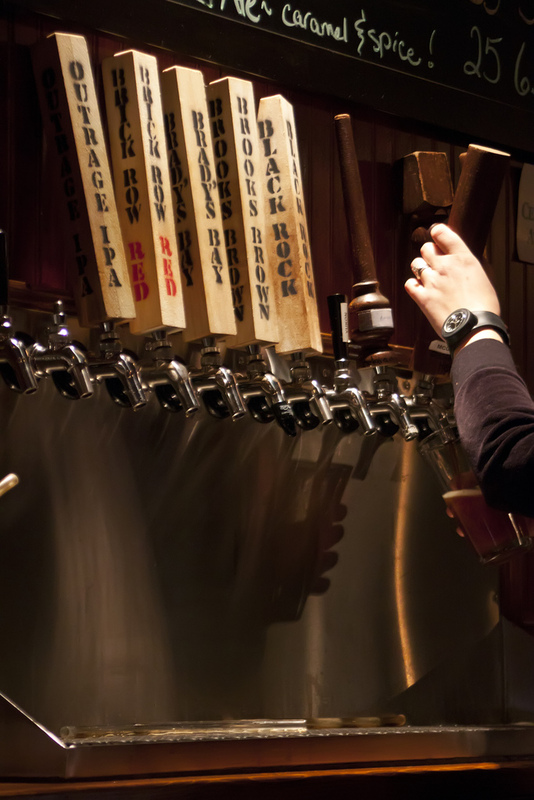 Three words: Black Rock Stout. What’s the one thing you’d like customers to know about you and your food? Andrew: If there was one thing that I could convey to all of our customers about Gracie’s, it’s that a great deal of care and thought goes into everything we serve. We have spent an extensive amount of time considering different options for sourcing the food that we, and ultimately you, buy. Our food doesn’t only taste good because we bought the best ingredients, though we do, it tastes good because we’ve cooked it, tweaked it, cooked it again, tweaked it again, and repeated this process until both of us have decided that it is as good as it can be – and even then, we are still always trying to make it even better. One last thing: what’s your schedule like for the next few months? 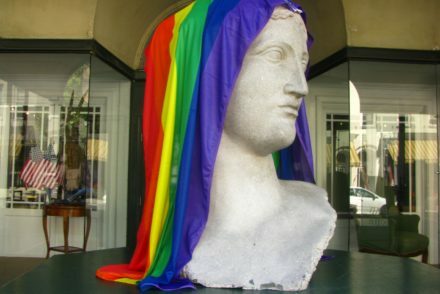 Any fun events coming up? We will be taking the truck out to several great events this season! Coming up soon, we will be at the Rip Van Winkle Wine and Cheese Festival on May 9th at the Catskill Point. We are very excited to announce that we will also be joining the Hudson Valley Food Truck Festival, at Cantine Field in Saugerties, on third Thursdays from May-October, where some of the area’s best food trucks gather for fun evenings of food, music and more. We will also be attending this year’s Beacon Riverfest, on June 28th at the Riverfront Park, a great event dedicated to music, food, and sustainability. You can find us throughout the season at the food truck garden at 347 Warren Street in Hudson. Our schedule is posted and frequently updated on our website, so you always know where to find us! Thank you so much, Allyson and Andrew! I hope everyone will check them out if you find yourselves in the Hudson Valley! That is so awesome! Doing what they love and enjoy such a unique experience! I know, I love their obvious passion and dedication! Love this interview; great to see people following their dreams! I love food trucks. All their food looks amazing! What a great story they have. I love food trucks, too (obviously? haha), and love that we have a little enclave of them in my town. It all *is* amazing! I need to sample the breakfast sandwich next! I am seriously in food heaven! I wish I could taste all their food. I’ve read everything and it’s so inspiring how they started and built up the business up to how they continue to serve only the best of quality food. There are not much food trucks from where I live and if there are any, it’s usually the fast food type with all the junk in them. Hmf! I agree, Rea. I’m so happy I decided to share their story- it’s nice when customers/fans get to understand what goes into a business like this! Sounds like a great place, I want to eat at food trucks more often! I love how popular they’ve become and that more cities & towns are relaxing their laws to allow them! Sheesh, so much awesome. 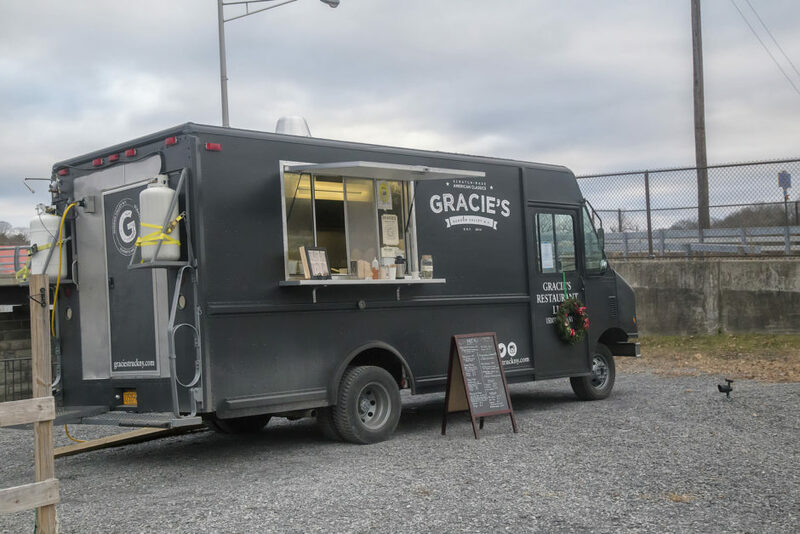 I will definitely try to find Gracie’s on one of my many jaunts through the Hudson Valley when I’m going the back way from the Berkshires to New Jersey. Cassidy and I really do have food truck dreams but we KNOW it’s hard as heck work. Worth it, of course. We’d have to find a way to ultimately get something running while he still initially has his steady job and I can still do my 5,000 jobs. It’s a dream. It may seem impossible, but who knows? Can I grab a doughnut burger through my monitor, please? Everyone’s allowed to have dreams! I think this is a fun one. What kind of food would you guys sell? Wow, thanks for sharing such an outstanding article on a genuinely great business! 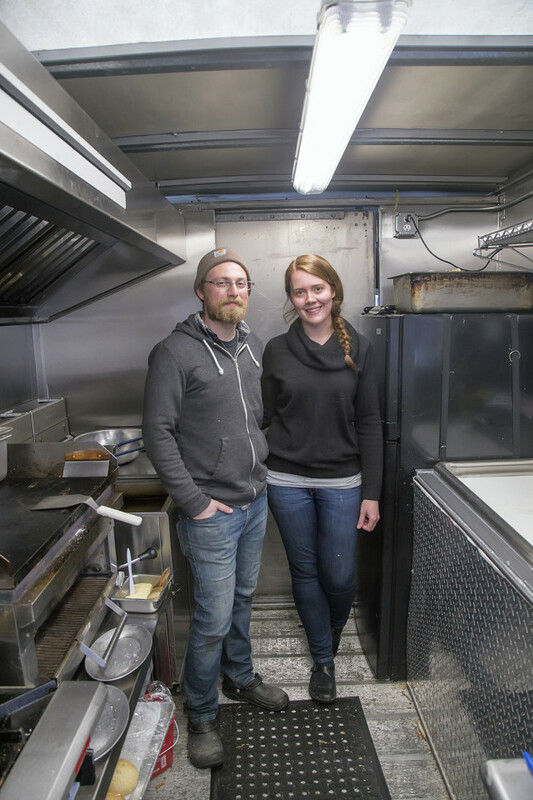 Many folks think as food trucks with a sort of glamor in mind seeing them on Food Network for example, but it is very hard work and requires such commitment which really comes through with both Allyson and Andrew in your post. Wish I were nearby the area to check it out, but certainly wish Gracie’s the greatest of success and prosperity. My pleasure, Peggy! I agree, it’s certainly not all fun and glamour but I’m so glad Allyson and Andrew do what they do with such passion. There are lot of things you can do when you have your own truck. Food truck is one of the good idea to do, making profit while traveling from one place to another.